I mentioned in my first post that a couple of decades ago I cooked on a river boat on the Mississippi River. There was a crew of 9 people including me. My day would start at 3:30am to make sure I had breakfast done by the time the crew changed at 5:30am. I had to make sure there was enough to feed 4 people twice because the one's going on watch ate first, then the crew coming off watch ate. Next to the Captain of the boat the cook is the most respected crew member. That is IF you could cook good food! It was a great job but kept me away from my kids for a month at a time. This was also pre-technology so there was no tv, cell phone or laptop to occupy my time. I spent my time reading cook books. With such a huge budget I was really able to try out a lot of new foods. The crew never complained and they loved the wide variety they always got. Not to mention all the desserts because I just love baking up a nice dessert! They all swore I caused them to gain 20 pounds in one month. One of the recipes that I tried and kept because it was not only good, it is easy was Red Beans and Rice. I decided to try it because many if not all of the crew were from Louisiana or Mississippi. 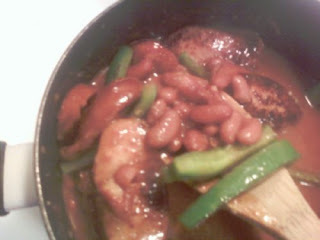 I ended up making a bunch of different Creole foods that they loved but I'm not one to eat tomatoes or okra. Keep in mind this recipe is not what traditional Red Beans and Rice would be. But it's an easy substitute that won't get many complaints. In order to make it more authentic you would need to use andouille sausage. Try serving this dish with some fresh hot cornbread muffins. When I make this again I will take more pictures. This is in the early stages of cooking. 1)Fry sausage in skillet in 1 Tablespoon oil until browned. Remove from pan. (I drain them on napkins.) Saute green peppers just until turning brown but not cooked. 2)In sauce pan combine all the remaining ingredients except rice. Add sausage and peppers. Simmer for 15 minutes and up to as long as you like. 3)Serve over hot white rice. This recipe is easily doubled and is great to feed a large family without going broke. On the other hand it's also easy to cut in half. It makes quite a lot and I will usually freeze leftovers in individual serving containers to have when I need a quick lunch. For onion lovers replace the onion flake with onions sauteed with the green pepper. If you don't have any experience with cayenne and are wimpy (like me), do not exceed the 1/4 tsp. You can always add more to your own plate or give it a shot of pepper sauce to increase the heat.